This astonishing novel – unlike anything Gilmour has ever written before – begins with a parent’s worst nightmare: the disappearance of a child. A father makes a casual error of judgment one evening and leaves his six-year old son alone for fifteen minutes. When he returns the child is gone and three lives are changed forever. Has the boy been kidnapped? Spirited out of the country? Is he dead? The story that unfolds is told by the novel’s narrator, a television host named Roman, who searches the city and a dreamy underworld for his son and tries to bring him back. Pursued by the unshakeable conviction that his son is speaking directly to him, Roman enters a haunting relationship with the missing child and his own conscience. In the meantime, his behaviour becomes increasingly erratic. He is rejected by his grieving and angry wife, fired from his job, and shadowed by an eerily persistent policeman, who thinks Roman is hiding the child. 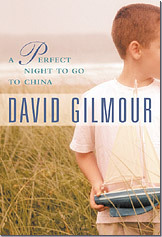 Written in the clear, elegant prose Gilmour is known for, A Perfect Night to Go to China is a deeply touching and original work of fiction. It sets up a harrowing premise and doesn’t let up until the last surprising page.